North Korea has ramped up its campaign to control outside information in recent years, but several defectors now living in South Korea said the regime's censorship efforts are showing signs of wear amid increased penetration and discontent. Choi Jeong Hun, broadcasting director of Free North Korea Radio, a Seoul-based organization that aims to broadcast global news into North Korea, said expanded information access has weakened Kim Jong Un's control over the population. "Things have changed within two to five years, information has gone into North Korea and has changed the mindset of the people," Choi told the Washington Free Beacon through an interpreter. "You now have an entirely different generation in North Korea made up of people who are exposed to outside information when they are really young." Choi described an incident in January where several passengers on a train traveling from the northern city of Hyesan to the capital of Pyongyang stood up to State Security Bureau agents who were harassing a mother and child for failing to possess the proper travel documents. Such defiance was inconceivable just a few years ago, he said. North Koreans who challenge regime authorities often face severe punishment, including imprisonment, under political resistance laws. "It's significant to note that the collapse of a dictatorship often begins when people don't obey the authorities," Choi said. "Witnessing these people voluntarily challenge authorities means that the regime and the system that controls the North Korean people isn't working." Free North Korea Radio, or FNK, was launched in 2005 by defectors who wanted to expose Kim Jong Un's lies to the citizens living in the isolated North. The shortwave radio broadcast carries news programs, interviews with defectors, and commentaries detailing a prosperous life in the South. The group also sends outside information into North Korea using balloons carrying thousands of leaflets. Park Sang-hak, who leads the balloon launches, estimates he and his team have dropped more than 1.5 million leaflets criticizing the regime in the North. North Korean authorities consider the balloon launches an act of war and have twice attempted to assassinate Park. In 2015, regime officials installed a fake bomb in his house in Seoul and threatened to kill his wife and son if he continued the launches. Park was undeterred. "It is our responsibility and our duty to send the message of truth and let the North Korean people know that the regime is a complete liar—they are brainwashing the people for their political survival," Park told Free Beacon through a translator. North Korea began deploying its own balloons carrying propaganda leaflets into Seoul two years ago to combat those arriving from South Korea, a signal that the FNK's information campaign is working, Park said. FNK also works to smuggle USB devices containing South Korean films and novels into the North. Choi said North Koreans rely on smugglers who cross into the North from China, crossings that are more difficult for regime authorities to prevent. Citizens have never had more access to outside information despite an escalation in surveillance and jamming efforts by North Korean authorities, Choi said. FNK is readying an information operation to target people in the North Korean military. Choi, who serves as commander in chief of North Korean People's Liberation Front, a paramilitary group in the South, said the group hopes to break military officers' commitment to the regime through USB deliveries and radio broadcasts. If FNK can change the mindset of military officers, those officers may spread the news to the thousands of servicemen below them. "The key to peaceful unification is the military not fighting against its people," Choi said. "If we establish a wide network inside the military then it would create a huge change. 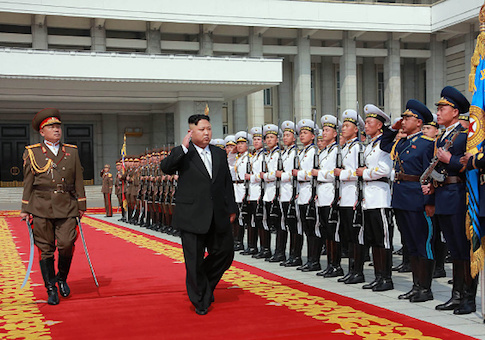 This will basically dissolve the military system that supports the North Korean regime." Choi speaks from personal experience. He served as an army officer in North Korea's hacking agency for nearly 20 years before he defected to the South. When he arrived in South Korea in 2006, he realized he had spent his entire life "serving lies." Choi and Park joined several other defectors in Washington, D.C. over the past week to meet with administration officials and members of Congress to advocate for an increased U.S. commitment to FNK's efforts.